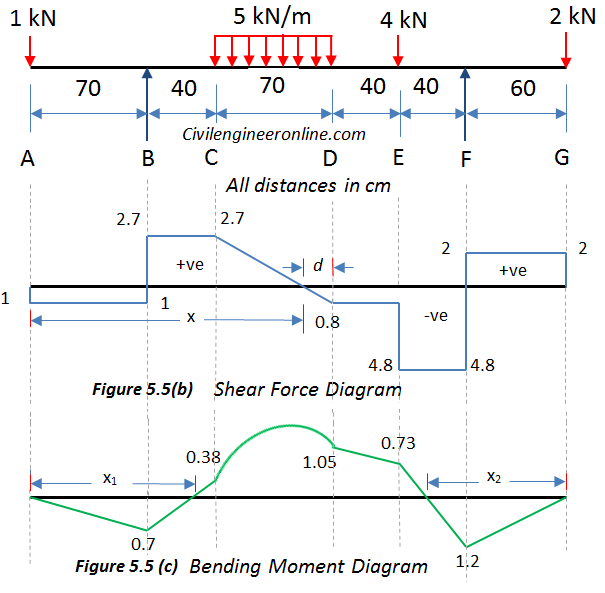 Draw the Shear force and bending moment diagrams for the overhanging beam given in figure 5.5(a) above. 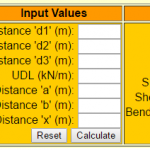 Also determine maximum bending moment and the points of contra-flexure. The given beam has two supports B and F and there are overhanging portions BA and FG on the left and right side respectively. For all the calculations we consider the origin of axes at point A and x-axis is considered positive in the right hand direction whereas y-axis is positive upwards. This beam is statically determinate as there are only two vertical reactions at the supports, one each at B and F and two equations of equilibrium (∑Fy = 0, ∑M = 0) are available to solve for these reactions. Now we apply the equations of equilibrium. Let the vertical reactions be VB at B and VF at F.
Algebraic sum of all the forces equal to zero; ∑Fy = 0. Algebraic sum of the moments of all the forces about B = 0; ∑M = 0 about point B. For the moments of force we consider clockwise moments as negative and anti-clockwise moments as positive. If a force is trying to lift up the left hand side of a section the SF due to that force is taken as positive whereas a force trying to push the left hand side down is taken as negative. In case a force lifts the right hand side of a section upward it will be taken as negative and if it is pushing it down the SF will be taken as positive. 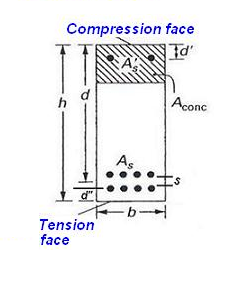 The point A has a concentrated force of 1 kN acting downwards. In such cases we should calculate SF before and after the point. At a section just before A the SF will be zero because there is no force before point A. When we consider a section just after A the shear force will be -1 kN because there is a force of 1 kN at A trying to push the left hand side of the section downwards. We will follow the same procedure to calculate the shear force at all the main points of the beam (A, B, C, D, E, F, G). We get the following values. SF just before B = – 1 kN (Note that VB is not considered as it is acting exactly at A, not before A.
SF just after C = SF just before C = 2.7 kN (Note that in case of uniform load the SF will be same just before and after the section). SF just after G = SF just before G – 2 kN = 0 (2 kN load is acting exactly at G, therefore it will be considered when we calculate SF at a point after G.
The moments which try to bend the beam in such a way that it is concave downwards are known as sagging moments and are taken as positive. The moments which try to bend the beam in such a way that it is convex upwards are known as hogging moments and are taken as negative. As per the definition, bending moment at a section is the moment of resistance of the section. Numerically it is equal to the algebraic sum of moment of all the forces on either side of the section. In this example we will consider forces on the left hand side of the section and take the moment of those forces about the section. Maximum Bending Moment will occur at the point where SF is zero. From SFD it is clear that the SF will be zero somewhere between C and D.
Let the point of zero SF be at a distance d from point D.
Hence the point of zero SF from A = 1.8 – 0.16 = 1.64 which is same as calculated in (a) above. 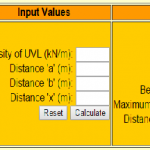 Therefore Maximum Bending Moment will be equal to the value of bending moment at a distance 1.64 m from A. The Bending Moment diagram is shown in figure 5.5 (c). The bending moment diagram under the uniform load is parabolic whereas it is straight line under other part of the beam. From the BMD we can see that there are two points at which the value of BM is zero and have opposite nature of bending on the two sides of these points; such points are known as points of contra-flexure. One such point is between B and C and the other between E and F.
We can locate these points in an easy way by writing the equation of bending moment for that part of the beam and putting that value equal to zero. Let the first point of contra-flexure be at a distance x1 from A. Let the second pint of contra-flexure be at a distance x2 from G.